Muscat is the capital and largest city in Oman, with a population slightly exceeding one million people. The city has a rich history and is located on the eastern coast of the Sultanate of Oman. The city has long-been a trading outpost, largely due to its geographic location near the Strait of Hormuz; this has had a large impact on the development of the city to its modern day form. 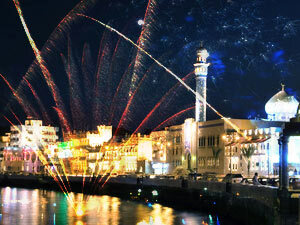 Today, Muscat’s port still drives much of the economy of the city. Muscat lies tucked in the rolling hills and mountains of Oman, and retains much of the historical charm the city acquired during its time as a military outpost and trading post during periods of both Persian and Portuguese rule. Since the ascension of Sultan Qaboos bin Said to the throne in 1970, the city has developed rapidly into a more modern city. Large malls and city centers are a common sight, and while there are very few high rise buildings within the city (an attempt to retain the cultural heritage of the country), buildings are modern and the city has become a sprawling metropolis with plenty to see and do. The city also lives its culture-the fish market is still a daily staple of the local diet, and the Mutrah Souk mixes old and new in a classic Arabian market. With beaches, amazing natural destinations nearby, and a lively populace, Muscat has painted itself as a vibrant place to visit or live.